Cast: Tom Cruise, Philip Seymour Hoffman, Michelle Monaghan, Ving Rhames, Billy Crudup, Laurence Fishburne, Simon Pegg, Jonathan Rhys-Meyers, Maggie Q, Keri Russell. Story: This franchise will self-destruct in five seconds. Any one of you could write the movie for Mission Impossible 3 without having watched it. We all know what we're going to get, and we're not disappointed. Mindless pyrotechnic nonsense - good fun if you're in the mood for it. I may as well ignore the plot and skip straight to the stuff you might not know. Philip Seymour Hoffman is the bad guy, and we already know how good he is from Boogie Nights and last year's Best Actor Oscar for Capote. Here he's in fantastic form, dripping off the screen in such an effective way that it makes you wonder why it took him so long to hit the big time. 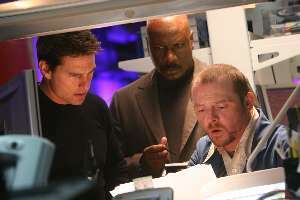 Tom Cruise is slightly less lunatic in this episode, perhaps trying to offset his real-life la-la-land, and he is typically strong (and suspiciously close to his co-stars' height). Among the myriad stars are Ving Rhames, Billy Crudup and Morpheus himself Laurence Fishburne, but I'm proud to say they are all kicked into touch by our very own Shaun of the Dead, Simon Pegg. Playing the typical quirky scientist guy, Pegg nails the part like none before him, adding some much needed levity to the serious, if not heavy, plot highway. Jonathan Rhys-Meyers is probably the weakest link. The only way he can get away with an Irish accent so unconvincing is because he is actually from Dublin so presumably no-one questioned it. But believe me, it's a bag o'shoite. Everything else is tackled with typical big budget flair, from the exploding Lamborghini Gallardo to the action-packed missile-laden chase sequences, all infused with the decades-old soundtrack we all know and love - and of course there are the silly cool gadgets to keep you chuckling while the fuse sizzles away in the background. The special effects are awesome this time round, with no there's-the-join realisations that usually accompany computer-enhanced tomfoolery, and the now obligatory face-transformation sequence is gleefully magnificent. It all seems so effortlessly achieved that Mission Impossible has become Mission Fairly Straightforward. Mission Impossible 3 holds no surprises whatsoever. It's a big budget action-fest with fantastic special effects and fun gadgets but less depth than Wayne Rooney's autobiography and an infantile political message pasted into one of the closing scenes. You know if you'll like it already, you make the call. Testosterone Satisfaction Rating: 4/5 - lots of very effective bang-crashy stuff. To enjoy this film you should be: an action-seeker. Mission Impossible 3 was released in the UK on 4th May.